Jugs or Pitchers Set of Three c1935. 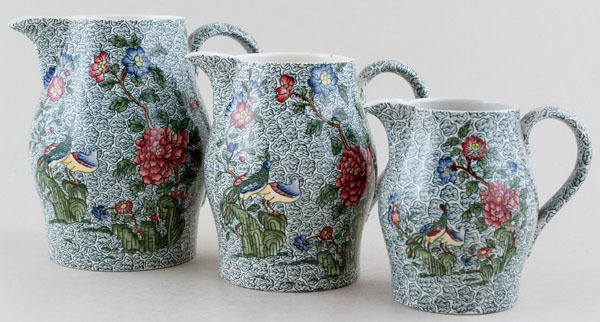 A wonderful set of three jugs, in the quaintly named Peacock and Parsley pattern, which was an original Spode design introduced under pattern number 4079 in 1825. It was reintroduced in the early 1900s and the design registered under number 575764 in 1910 and produced on bone china with pattern number R 4619 from 1912 and on earthenware with pattern number 2 6105 from 1908. This is the 1930s version produced under pattern number S 938 from 1935. The S series of pattern numbers is for underglaze decorated earthenware. Backstamp: Copeland Spode England seal mark and in script S/938 and impressed Copeland. There is a little very minor discolouration inside the largest jug, the middle size has a minor firing fault inside the spout and the smallest is in excellent condition. Overall excellent condition. OVERSEAS SHIPPING OUTSIDE EUROPE Owing to the size of this item a supplement of � about US$52 will be added to the standard overseas shipping charge.